A high school student recently contacted the Butterfly Center for some help and advice with a little experiment she was doing for one of her classes. She was investigating whether there was any correlation between size (body length) of jumping spiders and the distance they could jump. After her experiment was finished, the student brought three of the jumping spiders to us as she wasn’t prepared to keep them for the long term. Since the species she had obtained (Phidippus regius, the Regal Jumping Spider) is not native to our area, we didn’t want to release them, so we have them as “pets” for the remainder of their lives. Unfortunately they are too small to make good display animals – unfortunately, because they are among the most interesting and congenial of all spiders. 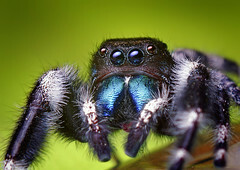 Jumping spiders are in the family Salticidae, the largest spider family in the world, with close to 5000 species known. Many are tropical, but salticids can be found in almost any habitat. They are different from the generic orb-weaving spiders that most people conjure up when they hear “spider.” Jumping spiders are small to medium-sized, furry, often colorful spiders that do not build webs, but do build a small silken shelter in which they hide when not out hunting. In fact, as spiders go these guys are incredibly cute! They are active during the day, and seem almost curious or even friendly. If you move your hand towards one, it usually will not run away but rather turns towards you, watching you, and backs up slowly or sometimes even jumps towards your hand. The cats of the spider world, these little fellows stealthily stalk their prey until it’s within their jumping distance, then pounce upon it with incredible accuracy. They seldom miss. But if they do, they don’t fall far; before each leap they fasten a silken lifeline to the surface, which they can crawl back up. 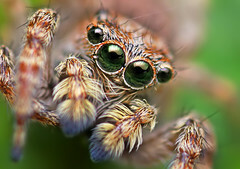 A jumping spider’s excellent eyesight is not only important in finding and catching prey. Many species are quite colorful, and color, movement, and perhaps even sound (apparently some males can make drumming noises) are all important aspects of their courtship displays. Take a moment to check out a couple of these sites to see photographs of these endearing and interesting creatures and to learn more about them. And next time you notice one, stop and say hello! They are quite harmless (except to the insects they eat) and are full of personality! I am enjoying watching one of these extraordinary spiders move about my living room as I am typing. When I opened my vertical blinds this morning, he was hidden behind one blind, while resting on the other. He didn’t seem to mind being exposed, he sat for a bit and then made his way up with no attempt to hide after being made aware that he was being watched. These are some of the smartest spiders that you will ever find. They rarely ever bite people, even if you carefully handle them. They are just as curious about you as you are of them. They will actually pivot their heads up to look at you. It’s an incredible experience to interact with one. It will have no problem introducing itself physically by jumping onto your hand if you allow it to. It’s no cause for alarm, the tiny fuzzy creature is not stalking you, he is just checking you out. There is no reason to kill it, catch it in a glass and let it go outside, they love the sunlight…! Enjoy the experience…! i love the blog! and i had a dream that there was a big furry black friendly spider that spun webs and i wasn’t scared of it, cause im afraid if spiders that was surprising! and there was this huge 28 inches long brown spider that was VERY AGGRESSIVE! (this was also in my dream.) and i killed the brown one but the black one still liked me afterwards so i kept it. DOES ANYONE KNOW THE BLACK SPIDER? IF IT EXISTS! PLZ FIND OUT FOR ME IVE DONE TOO MUCH RESEARCH TO KEEP GOING! I hate spiders but found one on a boat yesterday he looked very cool. it looked like it had a sad face and eyebrows it was white and furry I would move and it would move to look at me I made sure no one killed him and i took him on the boat back out side. We have one that we call Steve who lives in our house. We just let him roam and take care of any insects that he can find (and try to keep him from going down the drain). I imagine Steve is actually multiple Steve’s, so that is what we call them now. Next Post On being prey..